This recipe comes from one of our favorite restaurant cookbooks. Welcome to Junior’s! Remembering Brooklyn With Recipes and Memories from Its Favorite Restaurant. Welcome to Junior’s! Remembering Brooklyn With Recipes and Memories from Its Favorite Restaurant is an excellent cookbook if you want old style dinner recipes. Their recipes range from what you would find in a diner, to the home cooking faire. Junior's is a New York City institution, but you can make pancakes just like they do. Preheat the griddle. If you do not have a griddle, preheat a large nonstick skillet over medium heat. As you cook the cakes be sure that the skillet does not get too hot. In a large bowl, mix the flour, sugar, baking powder, and salt together then set aside. Using an electric mixer set on high, beat the milk and eggs until light yellow, then beat in the butter 1 tablespoon of oil, and add the vanilla. 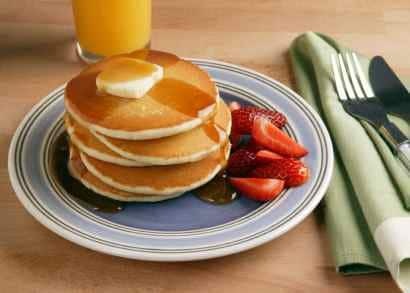 Turn off the mixer and add in the flour mixture, and beat on low just until blended and smooth, 1 to 2 minutes (do not overbeat at this stage or the pancakes can be tough).
. Quickly flip over the cakes and cook on the opposite sides until golden, about 2 minutes more. Serve immediately with hot melted butter, warm syrup, and warm Apple and Raisin Preserves. Loved these! They were a hit for breakfast, the family loved them!